Under the leadership of distinguished family business scholar Professor Pramodita Sharma, FECC has grown to become one of the best case competitions globally with 25 teams from 16 countries competing in 2019. FECC prepares participants to understand the critical issues that are unique to family enterprise by applying the knowledge and expertise they have developed in the classroom towards solving complex family business cases. During four tough rounds of competition, teams present their case to a distinguished panel of judges who will determine which group best understood, analyzed and presented the case. 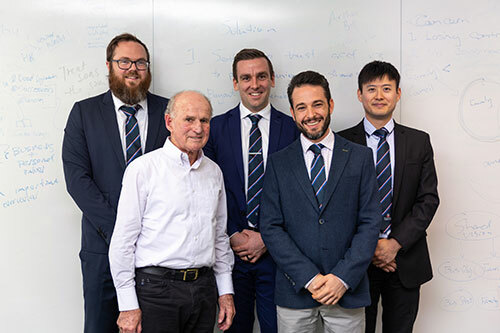 Left to right: Sean O’Gorman – MBA student; Richard Owens AM – family business owner and team financial sponsor; Brent Alexander – MBA student; Dr Frank Barbera – team coach; Jack Lee – MBA student. This entry was posted in Family Business, News. Bookmark the permalink.